A 3D printed name tag makes a fun gift for a child, especially if they have an unusual name or spelling and can't usually get stuff with their name on. In this tutorial we'll look at how to design a 3D printed name tag using Tinkercad which is one of the 3D modeling tools that work well for kids. Tinkercad is an online 3D modeling tool. It's very easy to get started with so it's perfect for a quick model to create while a child is watching. For an older child they can even create the model themselves while you talk them through it. Note that children under 13 cannot yet have Tinkercad accounts, but it is something they are working on. Preparation. Before making the model you'll need a Tinkercad account. A free account is fine for this project. You might also want to take the Tinkercad tutorials if you have never used a tool like this before. I'd also recommend trying the steps in this tutorial first before you try and do it with an excited child watching. 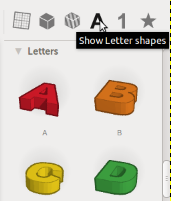 Click on the A icon in the top right of Tinkercad, this will give you the letters to choose from. Drag the letters you need on to the workplane (grid), don't worry about precise positioning yet. Use the + button to zoom in if you need to. Select all of your letters either using Ctrl-A or by drawing a box around the. Use the Adjust->Align tool to align the letters with the x axis. To do this, click on the click on the center dot that appears to the left of your letters. Drag the white square handle that appears in the middle of the group downwards to adjust the height of all the selected letters at once set those to 3mm (and leaving the other letters at the default 4mm) will give you something reasonably sturdy that won't take too long to print. Now distribute the letters evenly from left-to-right with a little overlap between each letter. Use the left and right arrow keys on your keyboard to move the letters only along the x-axis. You'll need to do this manually. Use to rotate tool to view your model from different angles. Now click on the Cube icon on the top right to see the Geometric Shapes and scroll down. Drag a Tube on to the workspace and place it to the top left of the name and resize it to 8mm by 8mm (or to your preference.) Adjust its height so that it's lower than the first letter, I went down to 2mm so I can put a key ring on it. Select all objects and choose Group to see how the finished name tag will look. Adjust the size of the name tag. Hold down Shift and Alt as you resize to keep the object in proportion. You can adjust the height back down to 4mm (or your chosen height) afterwards. Use Design->Properties to give your model a name. Now choose Design->Save and then Design->Download model for 3D printing. You'll probably want an STL file but you have a choice of options. Now it's time to 3D print the model. Kids love to choose the color of their name tag so if you can let them choose the filament color that just adds to the fun. You can also add a metal split ring to turn the tag into a keychain if you like.